"Where the little Cable-Cars climb halfway off the drawing boards..."
Pictured (right) is one of the four cable-cars in the city of Naples; this is the car on the Montesanto line as it pulls into the station on the street named Corso Vittorio Emanuele. It comes up from the main station in the city, makes this stop and then finishes at the top station on the Vomero hill at about 600 feet. The station in the picture is about one-third of the way up; at the half-way point, the single track will split into a double track to allow the car coming down at the same time (the cars are on the same cable) to pass the one going up. When the down-car then stops at this station, the car on the way up stops at a "blank station"—an empty spot in the tunnel—and waits. Then, they both start again and finish the run at the bottom and top stations, respectively. The other cable cars in Naples don't have any "blanks" along the way; there really are stations at those points. The simplest cable-car would be one with only a top and bottom station with a double-track by-pass at the halfway point. 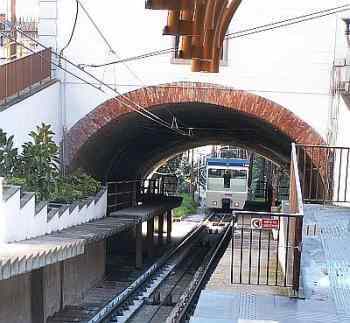 The old, famous cable-car of funiculì-funiculà fame on Vesuvius (not one of the four mentioned above) was like that. The others have more stations: The Chiaia line has four (including top and bottom, as does the Central line; the Mergellina line has five. All of the stations are on streets, or at least close enough so you can get out to the street via some stairs. Only the Montesanto line has a "missing" station. The plan was to turn the blank spot on the Montesanto line into a real station (since the car has to stop there anyway). There is no real street at that spot that would be served by a new station, but it would make it easier to reach the great tourist attraction of the Sant' Elmo fortress and adjacent San Martino museum. That is, the way it works now is that you ride the cable-car to the top, get off and then walk about 10-minutes over to the Vomero look-out, overlooking the city and directly in front of both the fortress and the museum. Ticket booth, turnstiles, a spectacular view of Vesuvius, and stairs leading down to the former "blank" station. There are four elevators not shown here. I think you might want to walk down and enjoy the view. Maybe on the way up from the cable-car station—named "Sant'Elmo"—you might want to catch a lift. A plan to do all this was approved in 2001. The whole deal was going to cost five million euros and be finished in 2005. Uh—the cable car is late. I mean really late. 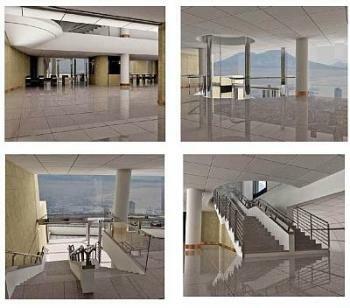 The new station and interior shots shown above are artists' CGI renditions. (There is, however, some talk of using real masonry and steel if this thing ever gets off the ground!) Work hasn't started yet. There is a map of all four cable-cars in Naples here.